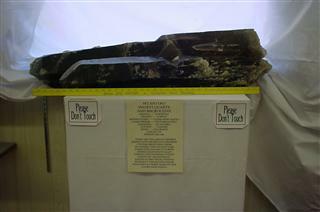 Come see the "Rock Stars", our lovely Colorado minerals showcased on the "Prospectors" show. Aquamarine, smoky quartz, amazonite, phenakite, fluorite. Admire and maybe pick up your own "Rock Star". Exceptionally large garnets from Ruby Mountain. Looks like this might be it for collecting at this locale - the site is inside our latest National Monument (Brown's Canyon). Lots more Colorado minerals including tourmaline from The Brown Derby and several unusual finds. Clubs are the best way to get in the swing of things. Check one out in your neighborhood or contact the Columbine Gem & Mineral Society to join up with our local rockhounds for some collecting fun. And for gold prospecting look into the Gold Prospectors of Colorado.